Coordinates: 24°41′42″N 84°59′29″E﻿ / ﻿24.695102, 84.991275 The village of Bodh Gaya is in the Gaya district in the Indian state of Bihar. It is situated west of the Phalgu River, a tributary of the Ganges River. India's 2001 census reported Bodh Gaya's population as 30,883. Bodh Gaya is considered by Buddhists as one of the world's holiest cities, having served as the place of Gautama Buddha's enlightenment. The main monastery of Bodh Gaya, around which the city was built, is the Mahabodhi Temple, which was designated a UNESCO World Heritage Site in 2002 based upon the criteria that it has "outstanding universal importance as it is one of the most revered and sanctified places in the world". However, this holy city reflects the discord of the human condition. It is located in one of the poorest and most violent regions of India. 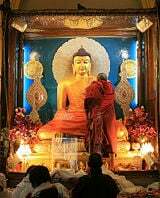 In spite of Bodh Gaya's illustrious past as the place of Buddha's enlightenment and its revered status, many of the city's people today suffer tremendous hardship. Archaeological excavations provide evidence of human habitation in Bodh Gaya as early as 1100 B.C.E. There is evidence of settled agriculture, hunting and fishing, as well as copper smelting. Homes were constructed of reed and bamboo or wattle and daub. Remnants of arrow heads, fish hooks, stone implements, and pottery have been unearthed. Cereals and rice were being cultivated, as is evidenced by rice husk impressions in the Black and Red ware pottery. The introduction of iron implements and coinage occurred between 600-200 B.C.E. Also arising during this time were new techniques in the creation of pottery, resulting in mirror-like light ceramic known as Northern Black Polished Pottery. The Iron Age was also the era of Gautama Buddha's life, especially significant to Bodh Gaya as the location of his enlightenment. According to Buddhist and Brahminical texts both Bodh Gaya and Gaya were beginning to host religious pilgrims by the end of this period. 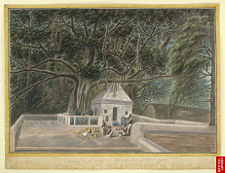 A small Hindu temple beneath the famous Banyan Tree in Bodhgaya, painting ca. 1810. Over the next several hundred years the village became a major Buddhist pilgrimage location. Emperor Ashoka visited Bodh Gaya approximately 250 years after Buddha's time, erecting a monument in the form of a shrine under the Bodhi Tree under which, according to tradition, the Buddha attained enlightenment. Ashoka is credited with being the creator of the well-known Mahabodhi Temple. Buddhism, and Bodh Gaya with it, flourished. The city was at the heart of a Buddhist civilization for centuries, with life being centered around the Mahabodhi Temple and other monasteries and monuments. At least four additional shrines were added to the main temple by the thidteenth century, at which time the city was conquered by Turkish armies. Bodh Gaya's temple and monasteries fell into ruin when state support ceased under the rule of the Islamic Sultanate of Delhi. During this time Buddhist Siddhas, and Shaivite Nath Siddha ascetics continued practice in the village and Shaivite ascetics established a permanent monastery. Eventually the Abott became the local ruler, which lasted until India's independence in 1947. The city's center, the Mahabodhi Temple, was in serious disrepair by the 1880s, when a Burmese mission to repair the temple began. At the same time the British annexed Burma, spurring the Britain into supportive action. At this point the British Archaeological Society took over the rebuilding of the temple under the direction of Alexander Cunningham. The present form of the temple complex is that of this nineteenth century reconstruction. Also during this time a Ceylonese Buddhist leader, Anagarika Dharmapala, began a long campaign to return responsibility for the temple to Buddhist management. Following India's independence in 1947 management of the Mahabodhi Temple became increasingly controversial. It was eventually taken out of the hands of the Hindu Abotts and put into the hands of The Temple Management Committee, formed specifically for this purpose. The committee consisted of both Hindus and Buddhists, with a required majority of Hindus. In the 1990s followers of Bhimrao Ramji Ambedkar campaigned for exclusive Buddhist control of the temple, which was granted. A common sight, Monks in the Bodh Gaya morning. Mahabodhi (meaning "Great Enlightenment"), in use as early as the seventh century C.E..
By 1861 when the temple was excavated and restored, it was popularly called Buddha-Gaya or Bodh Gaya. Bodh Gaya City is located in the Gaya district of the Indian state of Bihar, six miles (ten km) south of the city of Gaya. It is located on the western banks of the Phalgu River (or Falgu River, also known as Niranjana River), one of the tributaries of the river Ganges. Bodh Gaya Block covers an area of over 96 square miles (249 sq km) and contains 139 villages. The total population of the block is 91,882. 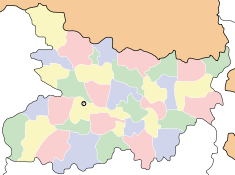 The population of the Bodh Gaya city proper was 30,883 according to the 2001 census. Bihar lies near the junction of the Gangetic Plain and the Choṭa Nāgpur plateau and is notoriously hot (highs of 35-40 °C; 95-105 °F) in the summer months of April to mid-June. Monsoon season takes place in June, July, August, and September. The weather is quite pleasant during the periods of October and November and February and March. It is mildly cold in the winter months, which consist of December and January (lows of 5 to 10 °C; 41 to 50 °F). The population of Bodh Gaya Block is predominately rural, with the majority of people participating in agriculture as a primary occupation. Crops in the surrounding region include grains, oilseeds, and sugarcane, aided through irrigation from four nearby rivers: the Son, Pūnpūn, and Morhar in addition to the Phalgu. Most of the money that comes into the area, however, comes from the tourism trade. 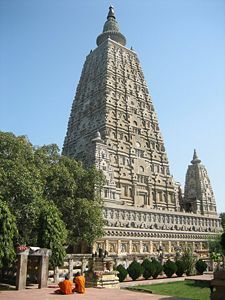 Bodh Gaya was designated as one of the four official pilgrimage sites by Gautama Buddha. 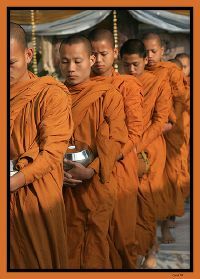 For this reason many devout Buddhists travel to the city as part of their religious development. The city plays host not only to the religiously devout, but also to those who travel to the city for its historic and cultural significance. India is seen as a rapidly developing country with a high growth rate. While the nation's poverty rate has been reduced significantly, 17.6 percent of Indians still live below the national poverty line. Since the early 1950s, successive governments have implemented various schemes to alleviate poverty, which have met with partial success. Much of the development has taken place in the larger metropolitan areas, and has not stretched significantly into the rural areas. The state of Bihar is one of the poorest and most violent regions of the nation. In spite of Bodh Gaya's illustrious past as the place of Buddha's enlightenment, many of the city's people today suffer tremendous hardship. Much attention is given to the city due to the potential of further development as a tourist destination and the profits to be made. There are also organizations working in the city with more altruistic purposes, such as providing education and improving literacy, helping citizens to find employment, medical care, housing and utilities. In 1953, Bodh Gaya began to experience development as an international pilgrimage destination. Buddhist temples and monasteries in the city have since been built by the people of Bhutan, China, Japan, Myanmar, Nepal, Sikkim, Sri Lanka, Thailand, Tibet and Vietnam in a wide area around the temple. These buildings reflect the architectural style and both exterior and interior decoration of their respective countries. The statue of Buddha in the Chinese Temple is 200 years old and was brought from China. Japan's Nippon Temple is shaped like a pagoda. The Myanmar (Burmese) Temple is also pagoda-shaped and is reminiscent of Pagan. The Thai Temple has a typical sloping, curved roof covered with golden tiles. Inside, the temple holds a massive and spectacular bronze statue of Buddha. In a 100 year old garden beside the Thai temple is an 82 foot (25 m) recently erected statue of the Buddha. There are two Tibetan Buddhist temples. The Mahabodhi Temple Complex consists of the Temple and seven additional sacred spots. It is divided into two sub-divisions; the principal section which contains the Temple and six of the sacred spots, while the secondary section holds the Lotus Pond (also a sacred spot) where the Buddha meditated in the sixth week following his Enlightenment. Mahabodhi Temple is constructed of brick and is one of the oldest brick structures to have survived in eastern India. It considered to be a fine example of Indian brickwork, and was highly influential in the development of later architectural traditions. According UNESCO, "the present temple is one of the earliest and most imposing structures built entirely in brick from the late Gupta period." Mahabodhi Temple's central tower rises to 180.5 feet (55 meters), and was heavily renovated in the nineteenth century. The central tower is surrounded by four smaller towers, constructed in the same style. The Temple is surrounded on all four sides by stone railings, approximately 6.5 feet (two meters) high. The railings reveal two distinct types, both in style as well as the materials used. The older ones, made of sandstone, date to about 150 B.C.E., and the others, constructed from unpolished coarse granite, are believed to be of the Gupta period (300 C.E. – 600 C.E.). The older railings have scenes such as Lakshmi, the Hindu goddess of wealth, being bathed by elephants; and Surya, the Hindu sun god, riding a chariot drawn by four horses. The newer railings have figures of stupas (reliquary shrines) and garudas (eagles). Images of lotus flowers also appear commonly. 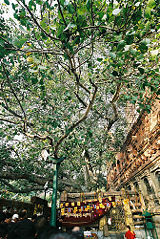 The Bodhi tree is the most prominent of the seven sacred spots. It is the tree under which the Buddha sat during his first week of meditation, and under which he gained enlightenment. Eighty feet tall, it is located behind the Temple. It is not the original tree of Buddha's time, however it is a descendant of that tree. A sapling of the original tree was carried by Emperor Ashoka's daughter (Sanghamitta) to Sri Lanka. A cutting from that tree was planted in Bodh Gaya when the original tree died. Under the tree is a red sandstone slab known as the Vajrasana, the diamond throne, marking the believed spot of Buddha's seat of enlightenment. The following additional sacred spots associated with Buddha's Enlightenment are also enclosed within the principal temple area. They signify areas on which tradition holds the Buddha further meditated upon the wisdom he had attained. They are connected by pathways and the whole complex is laid out with landscaped lawns and flowering trees. Animeshlochan Chaitya - The second week of Buddha's enlightenment was spent sitting directly to the front and right of the Bodhi Tree, meditating deeply upon it. A prayer hall (chaitya) was built upon the spot. Ratnachakrama - Also known as the Jewelled Ambulatory, this contains stone lotuses raised on a platform marking Buddha's steps taken the third week as he paced 18 steps back and forth near the Bodhi Tree. It is said that lotuses sprang up under his feet. The Ratnachakrama lies near the north Temple wall. Ratnaghar Chaitya - Northwest of the Temple, this small prayer hall marks the spot where Buddha spent the fourth week in meditation, receiving the vision of his future mission. Ajapala Nigrodh - This is a pillar marking the spot of Buddha's fifth week of meditation. Originally under a tree, Buddha sat and counseled Brahmans on the importance of performing good deeds. Rajyatana Tree - Buddha spent his seventh week under this tree. It is said he gained his first two disciples here; merchants who had come and offered him his first meal following his seven weeks of meditation. This tree is close to the temple, on its southeast side. The final of the seven sacred spots is the lotus pond where the Buddha spent his sixth week. This is the only of the spots separated from the others, but connected to the larger section by flowered pathways. 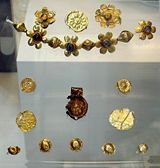 Offerings found at the Vajrasana, including a decorated coin of the Kushan emperor Huvishka, third century C.E. Buddha statuary in a niche in the Mahabodhi Temple. The sacred Bodhi Tree in Bodh Gaya. Buddha statue in the Mahabodhi Temple. ↑ British Library, Asia, Pacific and Africa Collections Retrieved July 7, 2008. ↑ 3.0 3.1 Peter G. Friedlander, Bodhgaya News Bodhgaya News. Retrieved July 8, 2008. ↑ World Heritage, Mahabodhi Temple Complex at Bodh Gaya Retrieved July 7, 2008. Ansari, A.Q. 1990. Archaeological Remains of Bodh Gaya. Delhi. Ramanand Vidya Bhawan. Buddha Dharma Education Association. Bodh Gaya - Place of Enlightenment Retrieved June 12, 2008. Pilgrimage India. Bodh Gaya Retrieved June 12, 2008. World Heritage. Mahabodhi Temple Complex at Bodh Gaya Retrieved June 12, 2008. All links retrieved December 17, 2016. Witcombe, Christopher L. C. E. Bodh Gaya, India Sacred Places. This page was last modified on 17 December 2016, at 22:31.